Traditional metal braces help align teeth, and can correct imperfections like gaps, crooked teeth, and bite concerns. 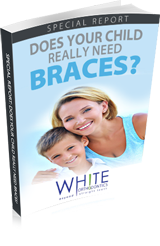 Dr. White can help you decide if traditional metal braces are the best treatment choice for your case. Traditional metal braces are stronger and more resilient than ever before, and can be heat activated to speed up the treatment process. At White Orthodontics, the archwire band and braces can even be customized with cool shapes and colors, making braces stylish and fun! How Do I Know Which Type Of Braces Is Right For Me? 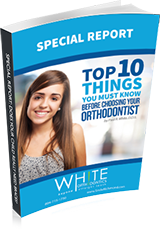 There are many benefits to the different types of braces and orthodontics that White Orthodontics offers. You may find that a certain type of braces fits your lifestyle better than the others. Ultimately, you and Dr. White will determine which solutions are the best fit for your case and lifestyle. Learn more about the different types of braces we offer, including clear ceramic braces, braces behind the teeth, Invisalign – even braces that can help you achieve a confident smile 50% faster! Learn more about our accelerated orthodontic treatment options, such as SureSmile, Wilckodontics, AcceleDent and Propel.